Expand your markets, services, and customer satisfaction, not your overhead. As a 3rd party onsite maintenance provider, Quest specializes in corrective and preventative maintenance field service programs — as well as rolling out on installation, integration and product upgrades for OEMs. With timely response per flexible and customizable service level agreements, Quest deploys its capable field service technicians to become extended hands and eyes on behalf of the OEMs to increase customer visibility. We create comprehensive service solutions that help our customers manage staffing and equipment expenditures. 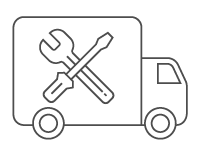 Our approach to field service is to provide strategically located, experienced mobile service engineers to decrease response times thereby shortening your equipment downtime. Quest also offers the convenience of working with a single service provider, with the scalability and flexibility to ensure all of your service needs are being met. From industrial device maintenance to bio-med equipment repair — Quest can promptly arrive on-site to provide the needed service. Expertise on-demand. Just in time. Take advantage of Quest's extensive range of customized field services to maintain a high level of customer satisfaction and experience. Quest is the ideal OEM partner for your industry-specific solutions as we service all equipment to device manufacturer's standards. With various biomedical, industrial, and aviation service options, Quest customizes select OEM products and services to help you differentiate your solution in the marketplace without increasing your global manpower.